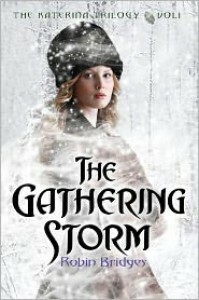 You guys know how I love mythology and I must admit that before reading The Gathering Storm, I'd never read anything about Russian mythology. And it's full of awesome!! I mean, really, I'm not really a big fan of vampires as a mythological creature, but they have these AND a bogatyr!! They have the tsar able to change into a bogatyr to defend his country, how cool is that? And apart from that, I did really enjoy most of the story. I was a bit overwhelmed by all the names and pet names and so on, but after a while I got the hang of it and it became easy to understand who everyone was talking to/about. And if I didn't know I assumed the characters weren't all that important anyway. I liked Katiya, she has big plans to study at the university to become a doctor in a period of time when society only expects her to marry and produce heirs. I really respected her drive and the effort she put into learning all she could about medicine within the limits of society's approval. There was one thing I had a big issue with: Katiya learns she has this ability and then she just refuses to be taught how to control it. She's given a book with information and she doesn't seem the least bit curious to actually read it and find some answers. I wanted to scream at her to not be so stupid, especially when she used her power without meaning to. And let's just say that unconsiously bringing someone back to life has some major consequences. So yeah, that part didn't work for me. Also, she was constantly ignoring advice from people older and wiser than she herself was and of course bad stuff happened because of that. I did like the interaction between Katiya and George Alexandrovich and I really enjoyed Katiya's bond with her family. The romance was a bit meh for me, but the court intrigue is fascinating and I loved the Russian mythology and hope it gets expanded more upon in the next book in the series!